Persuasive : If you want to change a reader's attitude, use this technique. The author needs to do research and support his or her thoughts with evidence and examples. Subjective : The writer depicts a list of pros and cons on the topic but doesn't show personal attitude. First-person : The author discloses personal ideas and thoughts. This technique is not common for academic writing, but some essays still include it. It doesn't base on facts as usual. Descriptive : To use this technique, one needs a detailed description to explain the story. More often than not, fiction writers use it. Narrative : This writing style tells a story. The aim is to lead the reader through the text and show how everything happened. Note: there might be characters, but the story comes from the author. Figures of speech : Numerous figures of speech exist, e.g., simile, metaphor, rhetorical question, alliteration, cliché, personification, paradox, etc. Using these techniques, you can provide a more accurate description. Narration : Every writing piece should have a story. This method explains how something happened. Description : It is similar to narration but has its peculiarities. For example, a well-written description makes a reader feel the same emotions the writer had. Process : It discloses how something develops step-by-step or shows how something works. Usually used for technical manuals. Comparison / Contrast : Shows the difference between two or more things. Usually, this method is based on two statements that have something in common, but it explains opposite views. Classification : If you need to divide something into types or categories, you should use this method. It consists of at least three components and shows key features of every single part. Cause / Effect : Describes the reasons/results of something happened. In your essay, you need to use causes or effects but not both at the same time. Argument / Persuasion : The author shows his or her attitude toward some fact or idea and explains it. Read your text aloud. Such editing technique can help you correct more mistakes. Mark mistakes. Print your text and mark mistakes with a pen/pencil. Look through the text once again and try to figure out more. Avoid common mistakes. Learning a foreign language is hard. If you want to write like native speakers, you need to think like they do. So, explore more about ten common errors in ESL writing , and try to avoid these mistakes. Use a blank sheet. Write down mistakes and consult dictionaries/guides to correct them. Ask a teacher. If you want to get rid of mistakes, ask your teacher to proofread your text and explain them. As soon as you understand what is wrong, you'll start writing better. Stay positive. Positive thinking motivates work faster and better, so get inspiration and start proofreading. Take a pause. Don't try to edit your papers once you've done them. Wait a bit to brush up on grammar and stylistic rules. Cut your text. If you want to create a good piece, you need to write down everything you have researched. Then, while editing, cut paragraphs or ideas that seem unimportant for your audience. Stop using adverbs. If you want to make your writing stronger, you'd better replace adverbs with verbs. You can use online tools or do it yourself. Don't use passive voice. Although using passive voice is important sometimes, it weakens an academic writing. Enhance the readability with active voice usage. Proper formatting. While there are different styles of essays (MLA, APA, Harvard, or Chicago), you should know requirements for their formatting by heart. Hire sophisticated writers. Once you have finished your essay, ask a professional team to edit it. Compare both papers and write down notes. Hint: read essay writing services reviews reviews before placing your order. The right tone. The tone of writing shows author's attitude toward the problem and readers. Using appropriate emphasis and subordination is important, so you should create your writing tone (not personal). Learn new words. Look through a dictionary or a thesaurus to find out words you don't know. Write down several words every day and try to use them in daily communication. Expand your vocabulary. Use proper vocabulary. To create an academic essay, avoid using nondiscriminatory language. Try to use words that are the most relevant to the description you have in your head. Don't write in 1st person. Avoid using pronouns like 'I', 'me', 'my', 'mine', etc. Academic writing should be impersonal. A thesis statement. To create make your writing stronger, use this trick. Try to provoke the audience to the discussion. Pure grammar. To develop a good writing, you need to improve your grammar, so taking extra classes is a must. Learn from gurus. There are many writers who succeed. Read their books, tips, and pieces of advice for young writers to learn something new. Practice a lot. Even if you don't have a task to write an essay, do it. The more you practice, the better your writing is. Some writers claim that writing 1000 words per day can help you hone writing skills. Share experience. If you are a student, you might have group mates who face the same problem. Get together to share your experience and try to help each other. Use online tools. Living in the digital era, you should get the most out of it. Thus, you may improve your writing with online tools and apps . Clean your writing desk. A messy table might distract you from the writing process, reducing your productivity. Start working when your desk is clean and there is no extra stuff on it. 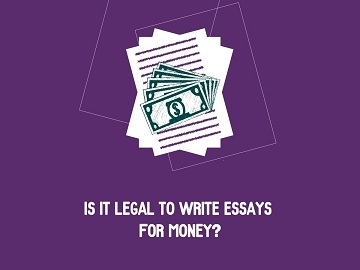 Here is an opportunity for you to Write Essays For Money.